I was invited to a Thanksgiving dinner here a couple of weeks ago. It’s like a lot of those non-family ones in the U.S. – that is, a potluck. 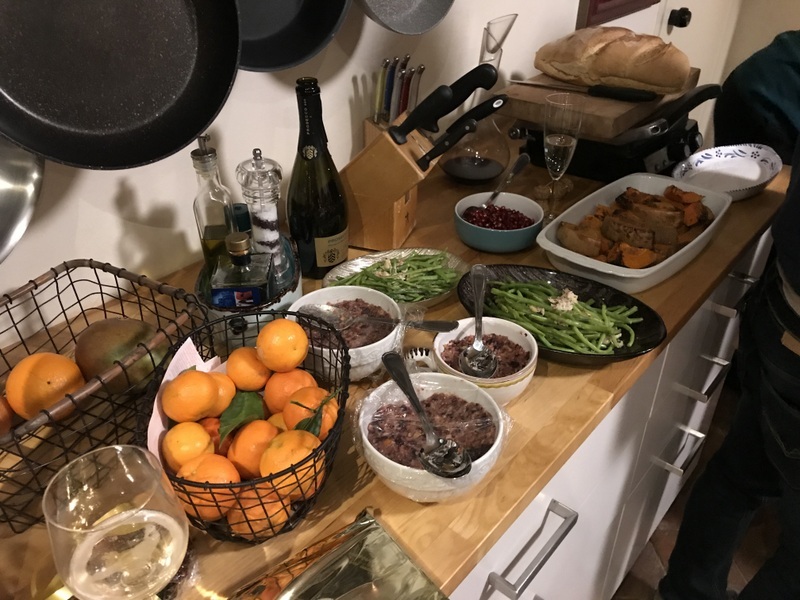 The hosts had some appetizers and roasted the turkey with another American expat and everyone else brought something to eat or drink. 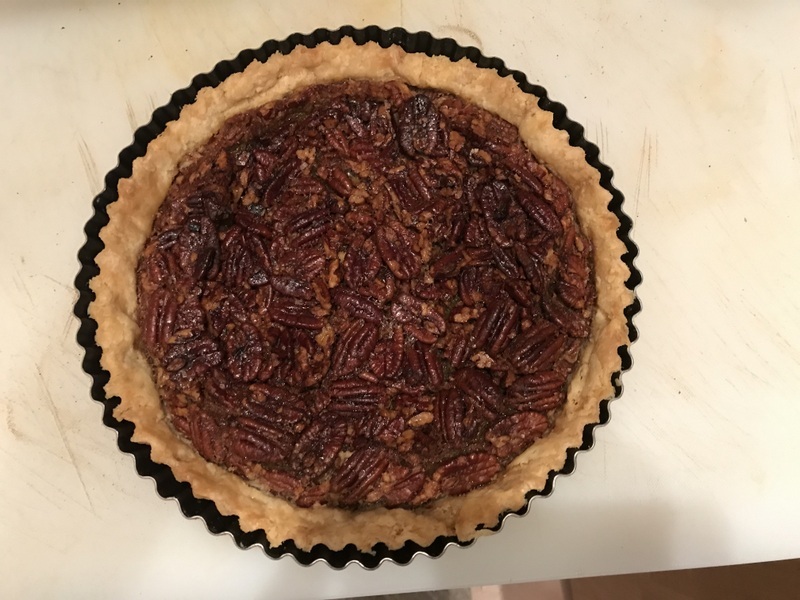 I decided to go very thanksgiving traditional with a pecan pie. Since pecans are strictly north american that makes them an exotic ingredient here. The traditional syrup for that pie is corn syrup which one absolutely cannot find here. I did find some italian site recipes for “torta di noci pecan” which used maple syrup so I basically made a hybrid italo-american pie. Given that both the syrup and pecans are exotic ingredients they had prices to match. So the ingredients for the pie came to about $20. Plus I had to buy a pie pan (toriera – i.e pan for a torta) and a rolling pin (matterello). I must say that the maple syrup was a terrific substitute and plan to never use corn syrup ever again. 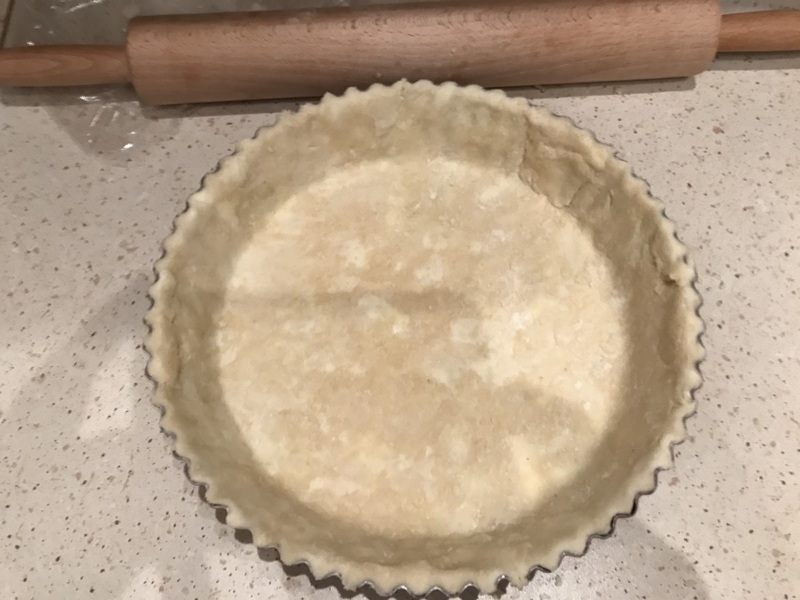 I might add that I have made pie crust a bunch of times but never completely by hand so I was pretty proud of myself for the success of the whole thing. The other ingredients. 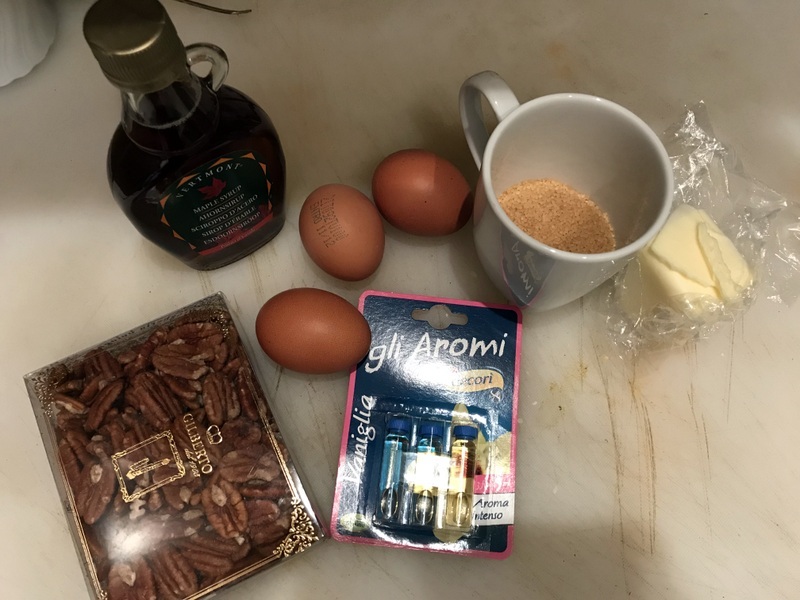 Syrup, eggs, brown sugar, butter, pecans and the cute little vials of vanilla. 9 milliliters each so one is just right for a pie. 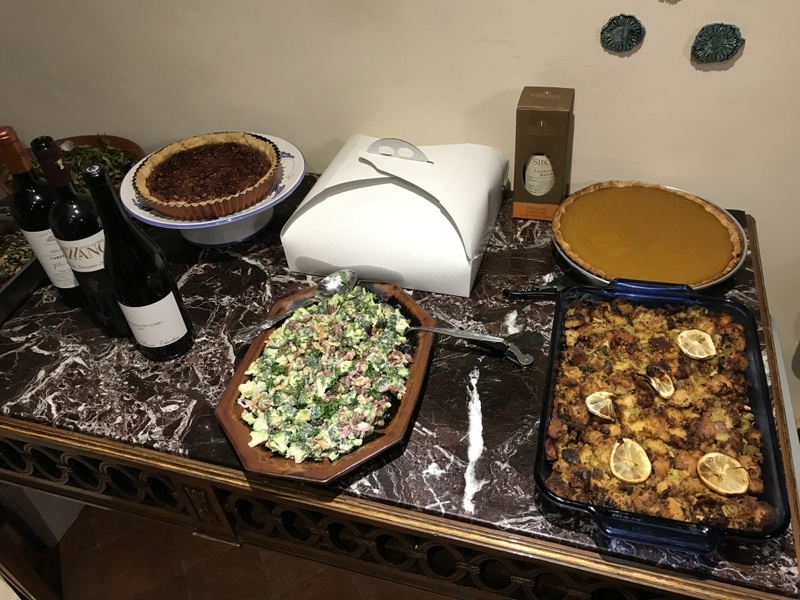 The dessert table included my masterpiece as well as pumpkin pie made by Harriet, an English woman. The boxed cake from a pasticceria (pastry shop) was brought by John, the non-cooking American. In the foreground a salad and roast stuffing. Gianni, the host with Steffani from Michigan in red. The other woman whose name I don’t remember is Italian. 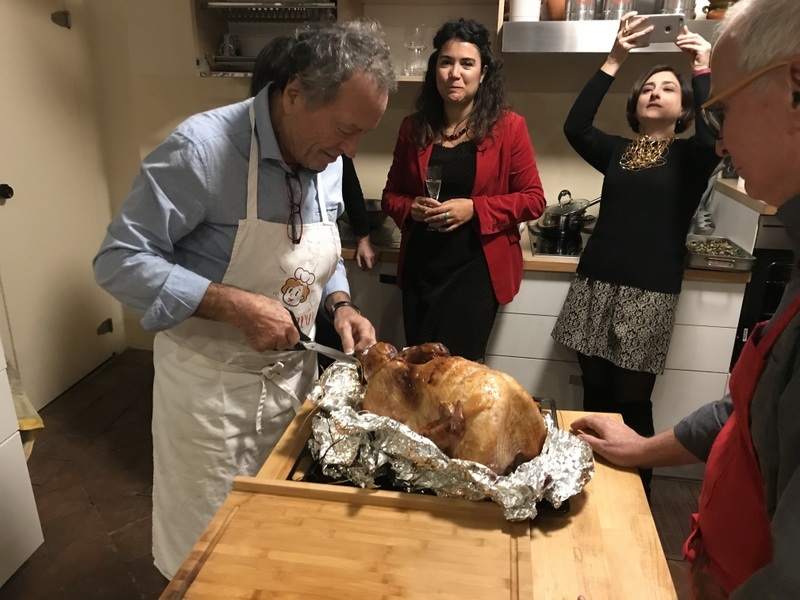 In the foreground right is Jim from Ohio who carved the turkey. A bunch of side dishes (contorni). Cranberry sauces (2 varieties) green beans and the orangey things on the far right are fat slices of pumpkin roasted and very good. Gianni and Loranza’s house is big enough to accomodate 19 people for dinner. Actually quite a spectacular house. 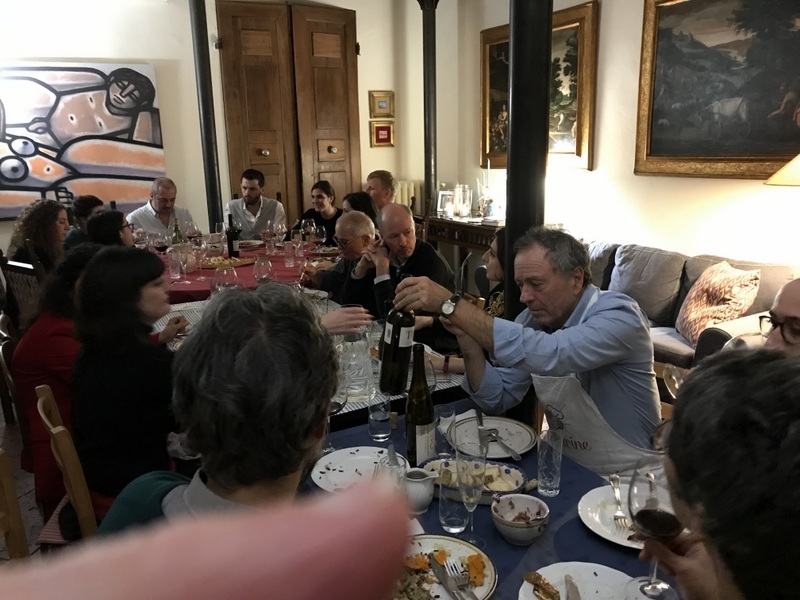 I think that we were 6 Americans, one each French, German and English and the rest Italians. Entering the “palazzo” (apartment building) where Gianni and Lorenza live. 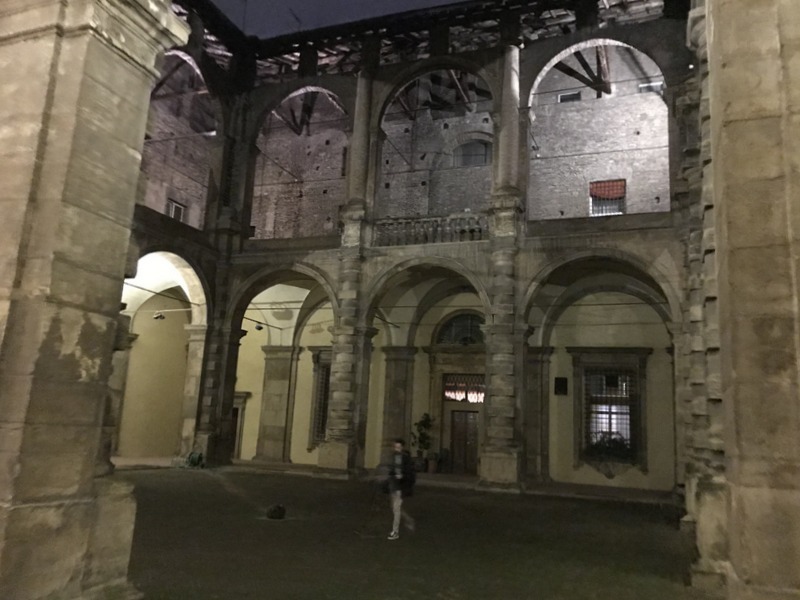 The courtyard is entered from a little corridor after the front door tall enough that a man astride a horse could ride inside. View across the first floor (which we would call the 2nd floor). Looking up at the ceiling above the first floor. The entry into their house. 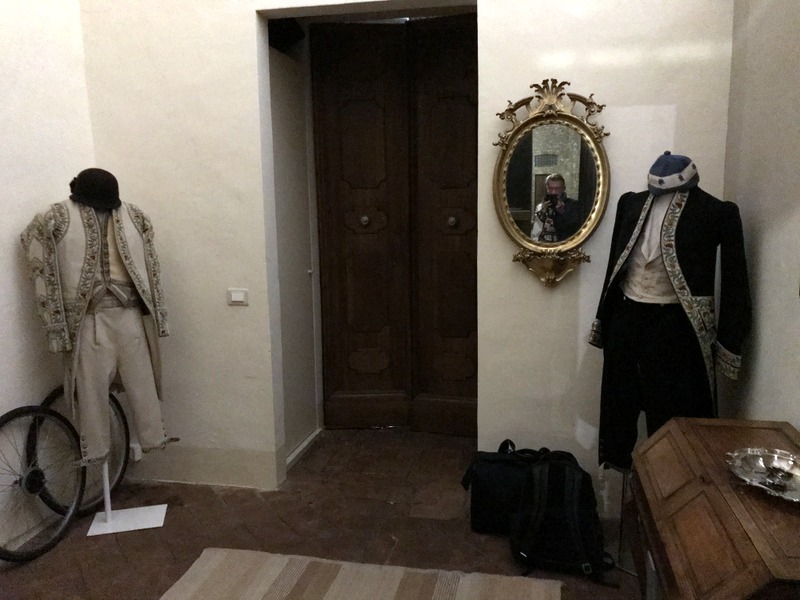 Gianni doesn’t know about the clothes on display since they rented the house furnished – it just came that way. 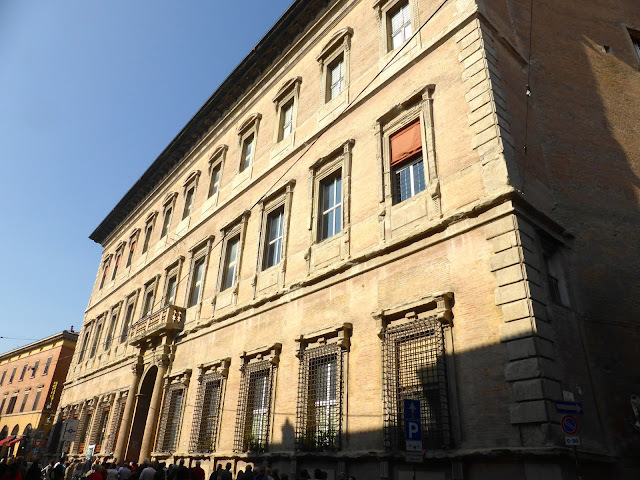 I was there in the evening so I didn’t get a photo of the front of the palazzo but found the one below from the web. 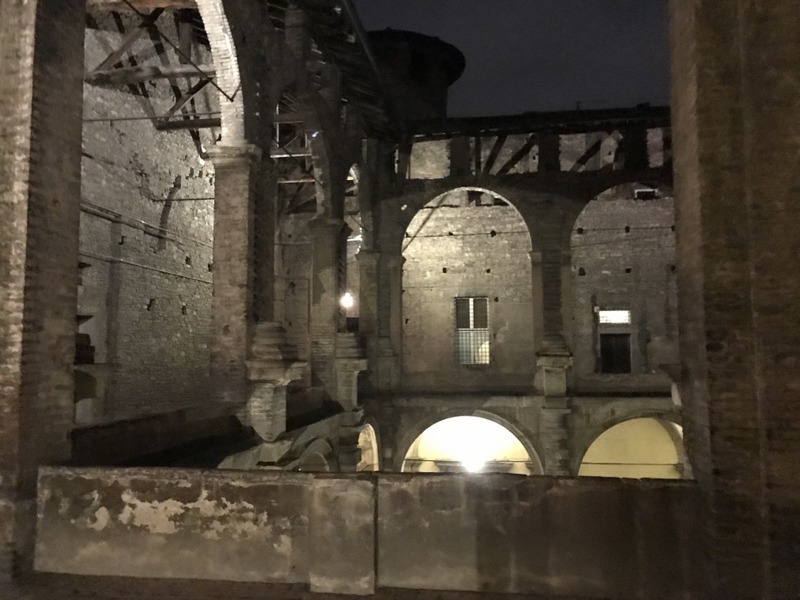 It was built by a member of a prominent family Bentivoglio in about 1570. 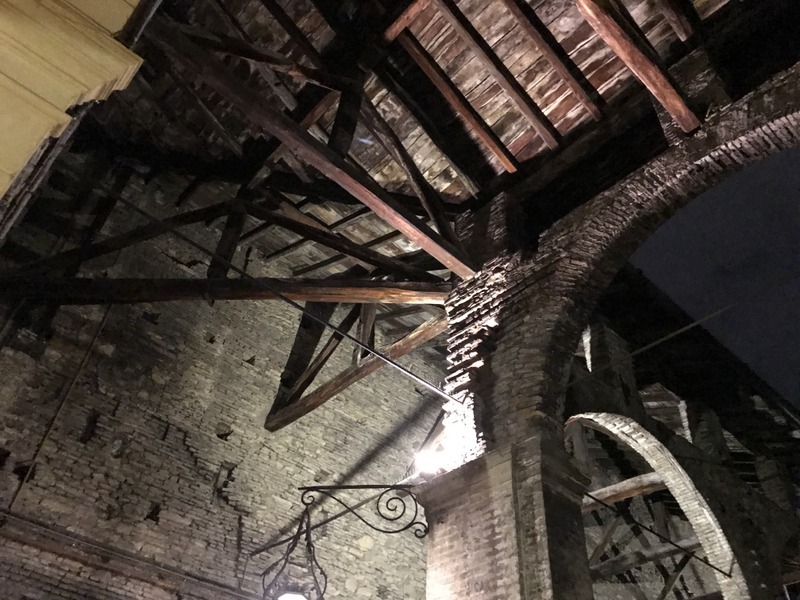 You can find more information about it by searching for “Palazzo Bentivoglio Bologna English”. Or if you omit the “english” you’ll get a lot of results written in Italian. By the way since I’m writing this on Black Friday in the U.S. I just thought that I’d show a little cultural seepage. 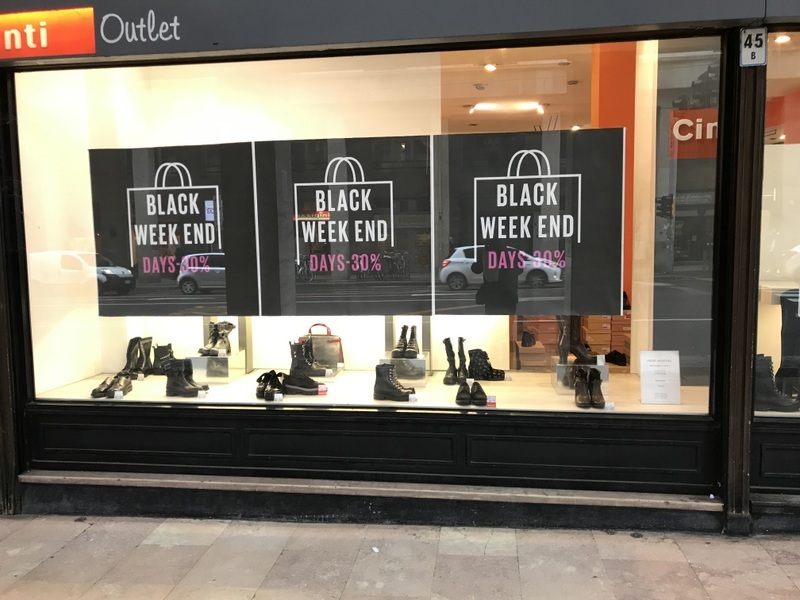 OMG Black Friday is here too! Well I had planned to buy a couple of heavy sweaters today anyway so it was nice to get a 25% Black Friday discount on both. I hope that you all had a great Thanksgiving! This entry was posted on Friday, November 23rd, 2018 at 6:05 am	and is filed under Culture, Food. You can follow any responses to this entry through the RSS 2.0 feed. You can leave a response, or trackback from your own site. Your pie looks wonderful! I plan to try substuting maple syrup for corn syrup from now on! The meal looks excellent! It is fun to see you settling in so beautifully! I was really surprised at how good the pie was with maple syrup. Of course it was made with corn syrup and pecans because it was an example of “cucina povera” i.e. cooking by the poor. Sometimes the best food comes from the inventiveness of those on the low end of the economic scale. And yes, I’m really enjoying it here. This is the first time, as of about 1 week ago that I have been here for over 90 days.